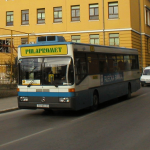 Despite being such an automobile-dominated city, Split’s bus system is widely used by its residents. 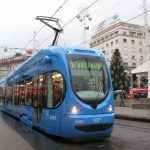 For that reason, the buses are efficient and plentiful, reaching almost every end of city and even extend beyond Split to Trogir, Solin and Omiš. It is entirely possible to both visit and live in Split without having a car. Although, some of the very old pre-war buses are still in circulation, so during the height of summer, the “vintage” buses can be an uncomfortable and smelly place to be. The greater Split bus system is broken down into 4 bus zones. Like most bus systems, the cost for a ride is determined by zone, number of rides and status (age, student, etc.). Below is the pricing scale from the Promet Split web site that we translated into English. All prices include VAT. For most people, you’ll just pay 11 kuna when you step onto the bus for 1 ride within Split proper. As with any public transportation, the Split bus system is not free of its own little nuances. Here are some of the ones I’ve discovered. Beware of holidays when some routes may run late if at all. Also, not all bus stops post the schedule for the buses that come through. The buses also do not notify you when you arrive at each stop. It’s best to know where you need to go and when the bus will come before you head out. The Promet Split web site offers 3 different ways to look up a bus route on their web site. The Old Fashioned Map – This is the basic map of all the bus routes with no kinks. For Split, click here, and for the broader Split area bus map, click here. The Route Selector – Just select your route from the drop down and a page appears with the timetable broken down by weekday (Radni Dan), Saturday (Subota) and Sunday (Nedjelja). Now, the timetable only shows the times from the beginning of the bus route. It does not show the time of arrival on a stop by stop basis, so you’ll have to do some guesstimating. At some of the busier stations, such as near Pazar in the center of Split, the buses tend to stack up in traffic. In that case, many of the buses will open their doors long before the actual stop. If you aren’t paying attention, it is possible to miss your bus entirely. Sometimes at night, a bus driver will not stop at a bus stop if no one has requested a stop by pressing one of the red buttons on board. If traveling at night, be sure to request your stop and stand up to indicate you want to get off. From time to time, a Sluzba Kontrole (inspector) from Promet will board the bus to check tickets. If you purchased a ticket from a tobacco stand, make sure you get it stamped when you board. If you get caught without a ticket the penalty is 50 kuna and you’ll need to pay it in cash on the spot. Yes, it happens. Best to be flexible. It may seem unnecessarily complex at times, but it’s pretty easy to figure out. The fact that you can buy a ticket on the bus is a big score for me. Do you have any tips for the Split Bus System? Share them in the comments. the packs of tickets are a much better deal (return tickets) in the long run, though you still have to pay cash. Also it took us FOREVER to figure out how to do the transfer: the stamp on your ticket will read the day (ie 04), the month (ie 11), and the HOUR (ie 08, 12, 14, 20, 22) you got on the bus and you have about an hour to continue using it. It was really hard to figure out the Promet system as an outsider! I’ll be taking my children on a trip to Split tomorrow, using #25 from Stobrec. Is it signposted, obvious how to walk to city centre or ferry? Many thanks in advance. We will need to get from Split bus station to Hrvojeva 6 21000 about 12:30 on June 23. What bus do we get? What is the fee for non-citizens? Thanks for reaching out! The cost for the bus in Split is 11kuna if paying on the bus and 9kuna if you buy a ticket in advance at a Trafika. There are not different prices for citizens versus non-citizens. Hrvojeva 6 is in the city center. The buses that will get you the closest are: 2, 3, 5, 5A, 8, 9, 10, 11, 14, 15, 17, 18. Thank you for this site! I am looking for a map of Split, with street names, which shows the individual bus routes. I am mainly interested in Zone 1 at this time. I went to Promet Split's site but, surprisingly, could not find anything. Could you help out and guide me in the right direction? Thanks for reaching out! 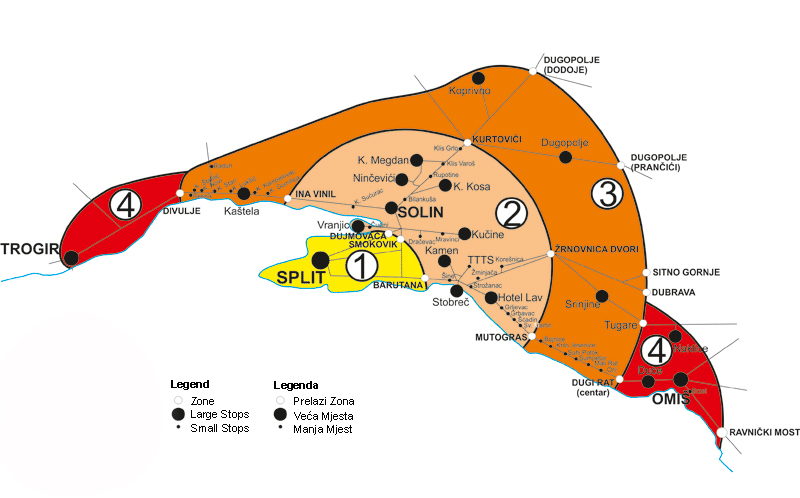 This is the closest map that Promet has to what you are looking for: http://www.promet-split.hr/sadrzaj/linije/Promet%20Split%20d.o.o.%20-%20mreza%20gradskih%20linija.pdf Not ideal, as it is missing some of the street names, but this is what they offer. Hi, our hotel is on Marmontova somewhere near Tonciceva. Would it be easiest to just walk from the bus station along the Riva and up Marmontova? Maybe you can help us. I’m looking for a bus map. We will stay in Podstrana and we would be interested to visit at least Omis, Split and One City shopping center. What buses do we have to take and maybe you can recommend some web site where we can find a bus map for all 4 zones? From Podstrana you can take the bus No. 60 to Omiš or the same bus in the other direction to Split. To get to the City Center One mall you’ll need to take the bus No. 18 from the Split center. Is there a translation or street name for the bus stops on Route 60, from this website…? No, there is no translation for the street names. To be honest, a translation of the street names would not help in finding the stops. Having difficulty locating the drop down noted in Route Selector paragraph. I’ve determined the route (18) and where I can get on and off: just don’t have the time it begins route. Would you point me in the right direction, thanks!! For bus line 35, you can take a look at this timetable to see at what times the bus departs from Dugopolje and heads your way. Unfortunately there’s no way to know for sure what time exactly the bus will get to your station. You can only estimate it but this of course depends on traffic. Asking some locals should probably give you a more precise answer. For times that are underlined in the table, the bus departs from Vučkovići instead of Dugopolje. Hello, i located in the port (sjeverna luka). If you are at the port, you are already in the Split city center. We fly into Split with BA on Sunday 3 September at 16:15 and it seems there is quite a gap for the Airport Bus then. Are there ATMs for us to get local currency at the Airport? Also, I see we can use the local bus 37 to get into Split and you mention you can buy an individual ticket for two trips (so we could use that as a return ticket) from the kiosks for 33 Kuna (covering all 4 zones from the airport to Split). Will there be a kiosk selling these tickets at the Airport and what do I need to ask for to get that type of ticket? Once we get into Split it will be the local bus station, which bus do I need to get to our accommodation in Matoseva 20, Split 2100? The easiest way to reach Split from the airport is with the Croatia Airlines bus. It picks up outside the terminal and you can purchase a ticket on board for 30kuna per person. The bus will take you to the main bus station in Split. From there, you can walk to the Pazar bus stop and catch the 8 bus to your apartment. Although, I would recommend taking an Uber instead as the difference in cost would be negligible, it’ll be much easier and you won’t have to worry about the navigating the local bus with your luggage. Yes, there are several cash machines at the airport, including 2 right outside of baggage claim. I’ve just looked at the Uber website and it says that popular trips are flat fee: Port to Airport is 225kuna? That seems a lot more expensive that two of us on the Airport bus? Yes, Uber offers a flat fee from Split to the airport of 225 kuna. However, taxis are even more, 330+ kuna. Yes, it’s a lot more expensive than the the airport bus, but that is because you are in a private car and can leave immediately. I’m flying into Split on a Monday in early October, arriving at 14:55. I need to get to Hotel Fontana in Trogir. Will bus 37 work well for me? If so, can I buy tickets at the airport or only on the bus? If on the bus, do I need exact change in kunas? I’ll get local currency from an ATM at the airport, but that probably will be big bills. I’ll have euros. Or is Uber better for me? I haven’t done Uber, but willing. But not sure I’ll have a working phone when I hit Croatia. Yes, you can take the 37 bus from the airport to Trogir. You may buy a ticket on the bus from the driver. You don’t need exact change, but small bills are best. My recommendation would be to take an Uber. It’s not far from the airport and will be easier. The airport is currently under construction, so you’ll pick up your Uber across the street from the airport on the corner of the intersection. You can also take a taxi, which are lined up right outside the terminal (as Uber can’t park there). Any suggestion how we can get there by public transport and which bus stop to get off at. To get to Stobreč, you first must get to the Sukoišanska bus station in Split. There are two ways to get there from the airport. You can either take the airport bus which follows every flight and drops you off at the main bus station. From there, take bus 9 or walk (10 to 15 min) to Sukoišanska. The second option is to take the city bus number 37 which is going to drop you off at the Sukoišanska station (it’s the last station for that bus). Once you have reached this station, take bus number 25 that goes to Stobreč. You can’t miss your stop because Stobreč only has one bus stop and it’s the last one for this bus line. To get to Hotel President from Stobreč, take bus 25 back to Split and simply walk to the hotel, it’s about 5 minutes walking distance from Sukoišanska. Going with buses would take you more time. Can you tell me how to get from Trogir to Krka National Park and back any day from 14th October 2017 . I have looked on the Croatia bus timetable but it only gives one bus at 10 am returning at 13.29.from Skradin. I’m pretty sure this will not give us enough time to look around comfortably. Have you any further information on other bus times please? We could get in to Split if the buses are more frequent from there in October. Unfortunately there are no direct bus lines from Trogir to the Krka national park. There are, however, buses that go there from Šibenik or Split. When you are researching bus schedules, what you actually want to look for is a bus line going to a town called Skradin, which is located just outside the entrance to Krka National Park. Here in Skradin, you can purchase entrance tickets to the park. You can get to Split from Trogir quite easily by hopping on bus number 37, which runs very frequently. When you are in Split, buy a ticket to Skradin at Split’s main bus station located in the harbor. Here is a link to the bus station’s website where you may check all available buses. For October 14, the earliest bus to Skradin is 8 AM, and the latest bus going back to Split is 7:45 PM. The ride takes about an hour and a half. Hello ! We search where we can buy a month subscription and if our french student card will work and what we need to do the subscription ? If you are in Split, go to the Promet office at Domovinskog Rata and Gunduliceva to purchase a monthly permit. You can see if the French card will work to get the student rate. Hello, I have an early flight tomorrow from Split. I suppose that the buss 37 will leave from the central buss station. What is the price of the ticket, do I need to pay tax for a notebook backpack? also I can buy the ticket from the buss driver? Bus 37 does not leave from the main bus station by the port. It leaves from a different station located here. The ticket price is 17kuna, which you can purchase from the driver. No, there is no additional tax for bags. Please note that Bus 37 is not the most efficient way to get to the airport. There is a Croatia Airlines airport bus that leaves from the main bus station by the port. There are no stops, it takes 30 minutes and costs 30kuna. You can check departures for that bus here. Thanks for the tip Sara. I bought tickets for the Croatia Airlines airport bus. It was 33 kuna. Does it leave from the bus station at the port? 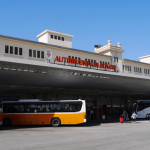 Bogdan – where in Split did the airport bus leave? Do they go at 5am? Hi, we are going to Zadar from Split in the morning during late July. What is the best way to do this? Is there more than one bus terminal? If so, which do we go to? The best way to go from Split to Zadar is by taking the bus. The distance is 155 km and the ride usually takes about three hours. You can check bus timetables and pricing here: https://www.buscroatia.com/. They are accurate and reliable. At the main bus station in Split, there are multiple lanes. When you purchase the ticket, they will let you know which lane to go to. They are all labeled. In addition, the buses will show their destination in the front window. Where can I get a bus from Split port to Klis? I would like to know the closest street names associated with the Bus Route 60 along the coast, between Postrana and Split (especially from Strožanačka cesta 27, 21312, Podstrana). Can anyone help please.